All the details on a break-through system for streamer fishing big trout, plus theory presentation and tactics. The jerk strip retrieve, essential to Kelly Galloups technique, is just one of the finer points of streamer fishing he will teach you. Discover the lines, leaders and patterns that will bring bigger fish to your presentation. Learn the tactics you need for fish that have charged but missed your fly!... Fly Selection: An innovative tier & creator of patterns, Kelly goes through his selection of patterns for streamer fishing. He reveals his system of selecting the style and color of his flies as he progresses through the fishing day. Learn the unique flies he has developed specifically for this technique. 120 minutes in length. 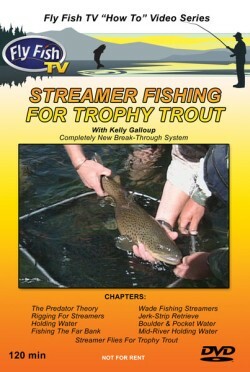 Another great Fly Fish TV video on DVD!